Here at Peninsula Dental Care, we are committed to providing exceptional dental services across a number of areas. Perfectly located for people within the Rye, Dromana, Sorrento, Mount Martha, Blairgowrie, Portsea, Red Hill, Main Ridge, Boneo and Mornington Peninsula area, get in touch with us today to book your appointment! A dental crown will work in the same way that your natural tooth works. They are strong enough to withstand the normal biting and chewing motions as a normal tooth would. However, they do require maintenance and replacement sometimes as they can become loose over time. Depending on the material used, the wear and tear, and the maintenance, a crown can last anywhere from 5 to 25 years. Dental crowns do not require any special maintenance; however, it is important to remember that the tooth beneath still requires care against decay and gum disease. Regular brushing and flossing is important to prevent these issues. Do you have missing teeth? Do your missing teeth affect your life, such as your eating, speaking or your confidence in general? A bridge may be exactly what you are looking for. 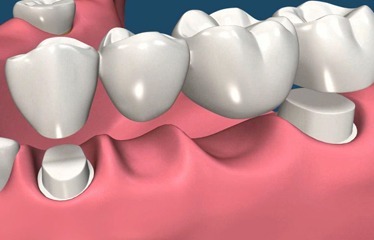 A dental bridge literally bridges the gap created by one or more missing teeth. There are three types of dental bridges available. A traditional bridge involves making a crown for the tooth or implant on either side of the gap, with false teeth in between. This is the most common type of bridge used. Other types include cantilever bridges, used when there are teeth on only one side of the gap, and Maryland bonded bridges, uses metal or porcelain wings usually on one side of the bridge are bonded to existing teeth. Dental bridges tend to last anywhere from 5 to 15 years, and sometimes even longer. Maintaining good oral health will assist in the lifespan of your bridge. Brushing twice a day, flossing daily, avoiding hard foods, and regular check-ups and cleanings with your dentist will all help towards this. Whether you’re in need of dental crowns and bridges, or if you are looking for teeth whitening, wisdom teeth removal, dental implants or veneers, look no further than Peninsula Dental Care. Our clinic is a trusted name throughout the Rosebud, Dromana and Rye area. Call us today on (03) 5981 2255 or book online peninsuladentalcare.com.au to book your appointment with someone from our trusted team.